Los Angeles' Wrigley Field: "The Finest Edifice in the United States"
Chicago’s Wrigley Field, known worldwide, is considered a national treasure. Much less known is its Southern California counterpart. Los Angeles’ Wrigley Field was built in the exuberant Roaring Twenties and demolished at the end of the turbulent sixties. Both its birth and demise echo the spirit of the times. The ballpark lived through the Depression, World War II, the postwar baseball boom, the decline of minor league baseball and a brief renaissance as a major-league ballpark. The history of Wrigley is intermingled with that of the City of Los Angeles. It hosted the fiercest rivalry in minor league baseball between the Pacific Coast League (PCL) Angels and Hollywood Stars as well as other baseball, boxing, football, high school and a myriad of community events. And this being Los Angeles, the ballpark appears in many motion pictures. The story begins in 1921, a few years after William K. Wrigley Jr. became principal owner Chicago Cubs, when he acquired the Los Angeles Angels of the PCL. After a dispute over parking at Washington Park, Wrigley decided to erect his own ballpark. Promising local fans a venue of major-league luxury, Wrigley commissioned architect Zachary Taylor Davis, who had designed Cubs Park (as Chicago’s Wrigley Field was then called) and Comiskey Park. Following Wrigley’s instructions to pattern the design after Cubs Park, Davis used iron and steel construction and designed a covered, double-decked grandstand from foul pole to foul pole, rarities in the minor leagues at that time. Built at a cost of $1,500,000,six times the cost of Cubs Park, it was dubbed “Wrigley’s Million Dollar Palace.” Seating about 18,500 in the grandstand and 2,000 in the bleachers, the ballpark was slightly larger than its Chicago counterpart. In later years the left-field wall was planted with ivy to further emulate that ballpark. The ballpark’s first full season was eventful. It began on January 15, 1926, with dedication of the clock tower by Commissioner Kennesaw Mountain Landis. On March 5, the Cubs became the first major-league team to play in Wrigley Field, losing the opener of a three-game series to the Angels. During the regular season, the Hollywood Stars, newly relocated from Salt Lake City, shared the ballpark with the Angels, an arrangement lasting through 1935. The silent comedy movie Babe Comes Home, starring Babe Ruth as Los Angeles Angels’ outfielder Babe Dugan and Anna Q. Nilsson as his love interest, became the first of many films shot at Wrigley Field. The Angels capped the ballpark’s inaugural season by winning the PCL pennant. In 1932 the New York Giants became the first major-league team to use Wrigley as their spring training headquarters.4 On September 6, 1933, with the Angels on their way to the pennant, the all-time PCL attendance record of 24,695 was set for a night double header.5 But by 1934, despite the Angels posting the best record in PCL history, the Depression was hitting Los Angeles hard and attendance was declining. The Angels and Stars drew less than 260,000 in 1934 compared to almost 400,000 the previous year. Hollywood had been losing money for several years, and in 1935 owner Bill Lane prepared to move the franchise to San Diego. The Stars went out in style, ending the season at Wrigley with a doubleheader against the San Francisco Missions. Actor Joe E. Brown amused the fans by umpiring in the second game and then pitching for the Missions with two out in the seventh inning to fan composer Harry Ruby while the rest of the team sat by the mound.6 The 1938 season saw a reincarnation of the Hollywood Stars when the Missions moved to Los Angeles and played in Wrigley for a year while awaiting the completion of their new ballpark, Gilmore Field, across town. Thus began a local rivalry enhanced by the competition between the west side and the central city/east side of Los Angeles. With the war over, in 1946 crowds flocked to the ballpark. The Angels and San Francisco Seals battled for the pennant throughout 1947, finishing in a tie. Home attendance that season had reached 622,485, the all-time record, and nearly 23,000 fans jammed Wrigley for the one-game playoff, with thousands more turned away. With no score in the bottom of the eighth and the bases loaded, Angels outfielder Clarence Maddern hit the first pitch over the left-field wall.13 Fans have called this the greatest game in Wrigley history. The Dodgers’ announcement that they would move to Los Angeles for the 1958 season came on October 8, 1957, one day after the Los Angeles City Council approved the transfer of Chavez Ravine to the Dodgers in exchange for Wrigley, with the idea of expanding the old park while the new one was built.20 Seating could be increased to 28,000 or 29,000 by enclosing the outfield with double-decked stands, the bleachers would be moved back towards Avalon Boulevard, and a 12-foot screen added in left. Then, the “soap opera” of where the Dodgers would play began, oscillating among Wrigley, the Coliseum, and the Rose Bowl. Expansion of Wrigley was reduced to 27,000, 26,000, and then to 24,000. Wrigley Field was found lacking; it had too few seats, too small a playing area, terrible parking, poor public transportation and it was situated in a declining neighborhood. Baseball Commissioner Ford Frick called it a “Cow Pasture.” He didn’t want to see Babe Ruth’s record of 60 home runs broken there.21 On January 17 the Dodgers and the Coliseum Commission agreed on a two-year contract.22 There would be no major league baseball at Wrigley Field—at least not yet. Now owned by the city, and with the PCL Angels relocated to Spokane, Wrigley Field was used for various events. On August 18, 1958, Wrigley held its second Heavyweight Championship fight with Floyd Patterson retaining the title over Roy Harris before a crowd of 17,000.23 In 1959, the television show Home Run Derby began filming and aired for 26 weeks.24 The show was a nine-inning contest between two of the top sluggers of the era, providing the inspiration for the Home Run Derby now part of the All-Star Game festivities. Then, in December 1960, the American League awarded an expansion franchise to Gene Autry christened the Los Angeles Angels. They were to play one year at Wrigley and four years at Dodger Stadium. 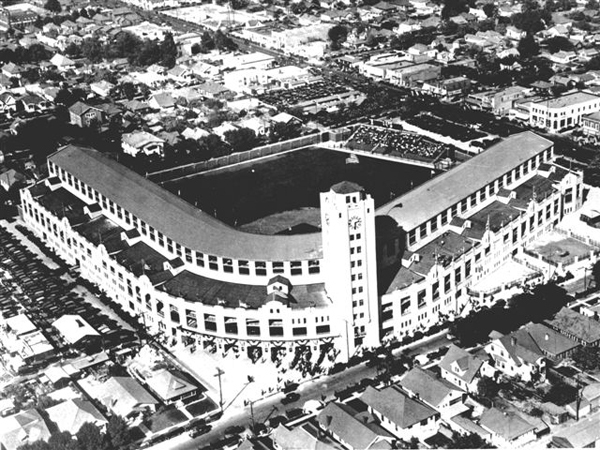 The Los Angeles press criticized O’Malley for not sharing the Coliseum and for forcing an unfair lease upon the popular Autry. Some of their comments related to Wrigley. Sid Ziff predicted rough sledding with parking conditions that were prehistoric, rundown neighborhood, with $75,000 has-beens. Mel Durslag called Wrigley “an obsolete concrete shack.”25 Al Wolf said “Mob scenes at Wrigley Field, with the Coliseum empty, will arouse resentment among fans who believe O’Malley maneuvered the Angels into that small, parkingless park.”26 He added, “It is unfortunate that the club must open for business on short notice in an abandoned minor league park.” Nevertheless, the City undertook renovations at a cost of $275,000 to Wrigley: fresh paint inside and out, replacement of the sod and the seats, improved restrooms, refurbishment of the tower offices, and installation of radio and TV booths in an enlarged press box. Wrigley Field hosted its first regular season major league game on April 27, 1961, after opening ceremonies featuring Commissioner Ford Frick and Ty Cobb.27 Sportswriters predicted the expansion team would be lucky to win 50 games, but the Angels won 70. General manager Fred Haney had played at Wrigley from 1929 through 1934 and managed the Hollywood Stars from 1949 to 1952. He was familiar with the park and structured the Angels accordingly. Thus the Angels were an excellent home team in their first season, winning 46 games for a .561 percentage. The characteristics that made Wrigley a home-run paradise are important. The power alleys were a short 345 feet; the foul poles were a respectable 338.5 feet and 340 feet, and center field was a robust 412 feet. However, the fences were angled toward the infield more than 9 degrees. Thus the distance to the wall decreased as one moved away from the foul lines. The minimum distance to the wall was about 335 feet in left and right, making the power alleys, left and right, and left-center and right-center easy distances. Wrigley Field obliterated the minor league record for home runs with 248, a record that lasted until 1996 when 271 homers were hit at mile-high Coors Field. How good a hitters park was Wrigley? The home run park factor was 180. Almost twice as many homers were hit at Wrigley than at the average American League ballpark. On October 1 the Angels’ Steve Bilko hit the last home run at Wrigley Field, a pinch-hit smash over the left-field wall with two out in the ninth inning.28 After the Angels departed for their four-year stint in the Coliseum, Wrigley Field staggered on for 7 1?2 years as a venue for local events. Its final highlight came on May 26, 1963, when a crowd of more than 35,000 attended the largest civil rights rally ever held in Los Angeles, where Martin Luther King Jr. said, “We want to be free whether we’re in Birmingham or Los Angeles.”29 August 1965 was a traumatic time in Los Angeles as civil unrest broke out and spread over the South Central area, culminating in what would be known as the “Watts Riots.” Many federal, state, city, and private commissions analyzed the causes of the unrest. One contributing factor was a lack of long-promised community services including parks, health and senior citizen facilities, and pressure built to have Wrigley Field better serve the community. In 1966, Wrigley was converted for soccer as arguments continued over final plans and funding. Finally, in March 1969, Wrigley Field was demolished to make way for the Gilbert W. Lindsay Community Center, which includes health facilities and a park with baseball fields still in use today. Wrigley Field had admirably served as a baseball and community sports center but its time had passed. Fond memories will always linger. JAMES GORDON retired from TRW/Northrop Grumman after forty years as an aerospace and nuclear engineer to concentrate on baseball and being a grandfather. His joy is attending baseball games around the country and documenting aspects of Los Angeles baseball history. Having been born in Brooklyn, he is genetically and emotionally a Dodger fanatic, although he reached Los Angeles fifteen years before the team arrived. 1. The Sporting News, 29 October 1925, 3. 2. Los Angeles Times, 23 July 1930, 1. 3. William F. McNeil, The California Winter League – America’s First Integrated Professional League, McFarland & Company, 2008. 4. Los Angeles Times, 18 February 1932, A11. 5. Los Angeles Times, 7 September 1933, A9. 6. Los Angeles Times, 23 September 1935, A10. 7. Los Angeles Times, 16 January 1939, 21. 8. Los Angeles Times, 18 April 1939, 1. 9. Chicago Daily Tribune, 10 December 1941, 33. 10. Los Angeles Times, 10 December 1941, 10. 11. Los Angeles Times, 5 August 1942, 1. 12. Los Angeles Times, 8 August 1942, 11. 13. Los Angeles Times, 30 September 1947, 8. 14. Los Angeles Times, 8 August 1952, C1. 15. Los Angeles Times, 11 August 1952, C1. 16. Ned Cronin, Los Angeles Times, 8 February 1955, C3. 17. Los Angeles Times, 21 March 1955, C1. 19. Frank Finch, Los Angeles Times, 16 September 1957, C1. 20. Frank Finch, Los Angeles Times, 9 October 1957, 1. 21. Los Angeles Times, 12 January 1958, C1. 22. Frank Finch, Los Angeles Times, 18 January 1958, 1. 23. Paul Zimmerman, Los Angeles Times, 20 August 1958, C1. 24. Joe King, The Sporting News, 2 March 1960, 8. 25. The Sporting News, 14 December 1960, 7. 26. Al Wolf, Los Angeles Times, 19 December 1960, C1. 27. Braven Dyer, Los Angeles Times, 28 April 1961, C1. 28. Braven Dyer, Los Angeles Times, 2 October 1961, C7. 29. Los Angeles Public Library Photo Database, #00032099, 1963.